More details about map compiling can be found here. Save Map: Saves the map before compiling. Run CaBSP: Runs the CaBSP compiler when compiling (this can't be deactivated since it is the essential part of compiling a map). 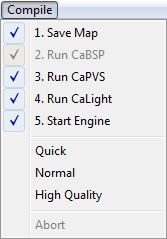 Run CaPVS: Runs the CaPVS (Potentially Visibility Set) compiler when compiling a map. Run CaLight: Precomputes static lighting when compiling a map. Start Engine: Starts the engine when the map is compiled. Compiles the map in low quality. Compiles the map in medium quality. Compiles the map in high quality. Aborts the currently running compiling process.